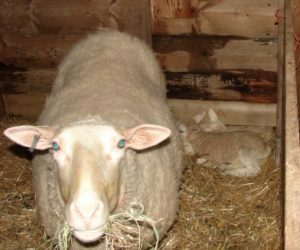 Lambing season started earlier than expected this year. The first event was not a birth but a pregnancy related injury – a prepubic tendon rupture in one of the yearlings. Also known as a belly hernia, this is a major problem for both the mother and the babies with no clear best practices for treatment. The mother can’t deliver unassisted. The foetuses need to be within two weeks of term to be viable but the environment within the herniated belly is stressful. We decided to induce labour 5 days after the injury, which increased chances of putting the babies within that two week range. 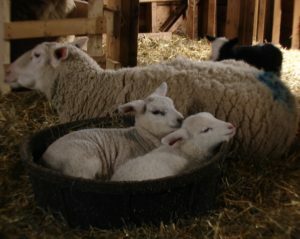 The vet delivered two lambs, one of which did not survive. After a day inside, being warmed and fed colostrum, the survivor seemed lively enough to graft onto one of my mature ewes. Timing was perfect as I was able to introduce him totally slathered in birthing juices from her singleton. Seems to have taken and he’s thriving without any further attention on my part. The first natural delivery was a set of quads, followed by a bunch of very large singletons and twins. It was fortunate that I was present and able to help. 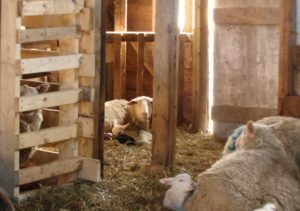 After a five day lull, the remaining four mothers gave birth to a singleton, another set of quads and two sets of triplets. All seem to be healthy, although one of the quads is a bit smaller than her siblings and the mama with triplets seems to have damaged her bag. (someone jumped the divider in the barn and went rummaging around the hay before jumping back into the pen. guess who.) Those lambs are getting supplemental milk for the time being. So, 22 lambs from 11 ewes. 200% rate but rather uneven family units. Now that I’m past the sleep deprivation part of lambing, it’s time to get back to the forge and finish work on the Flight Series, although it’s wonderful distraction watching the lamb parade.